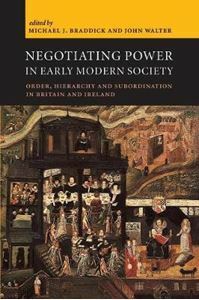 Quick overview Addressing the dynamics of power in early modern societies, this book challenges the existing tendency to see past societies in terms of binary oppositions - such as male/female, rich/poor, rulers/ruled - in which the disadvantaged have influence only in moments of direct confrontation. Addressing the dynamics of power in early modern societies, this book challenges the existing tendency to see past societies in terms of binary oppositions - such as male/female, rich/poor, rulers/ruled - in which the disadvantaged have influence only in moments of direct confrontation. Drawing on recent social theory, the essays offer a series of micro-sociologies of power in early modern society, ranging from the politics of age, gender and class to the politics of state-building in the post-Reformation confessional state. They explore the weapons with which subordinated groups in their everyday lives could moderate the exercise of power over them. Recovering the agency of the disadvantaged, the book also explores the limits to the power that the disadvantaged could claim in the past. Its findings also have relevance for thinking about inequality in present-day societies.